Russian Stamp Catalogue, Identifier, and Price Guide. 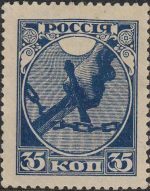 RusPhil.com is a free Russian stamp catalogue, identifier, and price guide for Russian stamps: Empire period, RSFSR, Soviet era. Forgeries, varieties, essays, and other information. 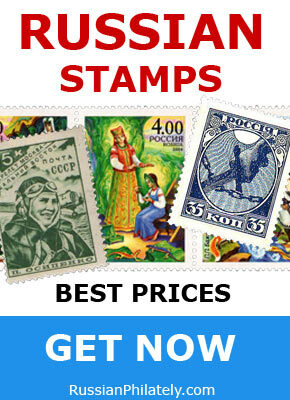 We recommend the RussianPhilately.com, an ultimate online Russian stamp dealer. The first Russian postal stamp was issued on December 10, 1857 by the circular of the Postal Department “On the bringing of postal stamps for the common use” with the following content: “Starting from the 1st January of the next year 1858 usual private letters to all the places of the Empire, the Kingdom of Poland, the Grand Duchy of Finland brought to the post in usual envelopes or without envelope at all just with addresses written on the letter itself should be sent only with the stamp corresponding to the letter weight”. The first stamps went on sale 10 December 1857, but officially people started to use stamps to pay internal correspondence in Russia from January 1, 1858 (from March 1, 1858 – in the Caucasus, Transcaucasia, and Siberia). Since this time all private letters have been sent only with postal stamps that were cancelled with two crossed lines. Empire, local issues (Zemstvos), Poland, Russian post offices abroad (China, Crete, Ottoman Empire). Armenia, Azerbaijan, Army of the Northwest, Batum, Belarus, Estonia, Far Eastern Republic, Georgia, Latvia, Lithuania, RSFSR, Siberia, South Russia, Transcaucasian SFSR, Ukraine (tridents), West Ukrainian National Republic. Dobin, Manfred. Postmarks of the Russian Empire (Pre-Adhesive Period). 1993. Zagorsky catalogues (Standard-Collection). Empire, RSFSR, and Soviet periods. In Russian and English. Kiryushkin A.P., Robinson P.E. Russian Postmarks. 1989. In English. Kiryushkin A.P., Robinson P.E. Russian Railway Postmarks. 1994. In English. Gurevich and others. Grand Zemstvo catalogue. Seven volumes. In Russian. Dr. Raymond J. Ceresa. The Postage Stamps of Russia 1917-1923. Five volumes. Civil War period. In English.